The New Year is a good time for thinking about the future. Reading stories like: “Ten 100-year predictions that came true” from BBC News Magazine and seeing RMIT Gallery “2112 Imagining the Future”, a diverse and engaging exhibition of art from local and international artists about the future. Will the future be utopic or a dystopic or some kind of combination, a strange, cool Japanese future where people wear costumes? Will it be the end of the world? In imagining the future there are still paintings – that probably wouldn’t have been predicted a century ago. Maybe the future never happened, maybe, as Sam Leach’s painting, “We Have Never Been Modern” (2011) suggests, we are still living in a mythic past. In the painting priest/scientists in their white coats unveil something that an eagle perches on. Leach was not the only painter in the exhibition: Tony Lloyd and Darren Wardle’s landscapes. However, photographs, video art, sound art and sculptural installations dominated the media used for visions of the future. Using 3D stereoscopic technology NOW and WHEN “Australian Urbanism” shows amazing images of Australian cities and giant mines. (“Australian Urbanism” was featured in the Australian Pavilion at the 12th International Architecture Exhibition, la Biennale di Venezia 2010). There was the constant hum of machines throughout the exhibition. Kenji Yanobe’s “Atom Suit Project: Antenna of the Earth” (2001) is an impressive centrepiece for the exhibition. http://www.yanobe.com/aw/aw_atomsuit.html Surrounded by hundreds of miniature versions of the Atom Suit, some lighting up and going “ping” occasionally. (Could this have something to do with Geiger counter?) The figure in the Atom Suit with his ocular wand is between a scientist and shaman. On the back wall in a large photo, Kenji Yanobe is shown wearing the suit on a desolate saltpan, like a shaman in the land of the dead. Around the corner Patricia Piccinini’s “Game Boys Advanced” lean against the wall absorbed in their game. They are well positioned near Keith Cottingham’s “Triplets”, 1993 and the colour palette of an imaginary seed bank by Lyndal Osborne. 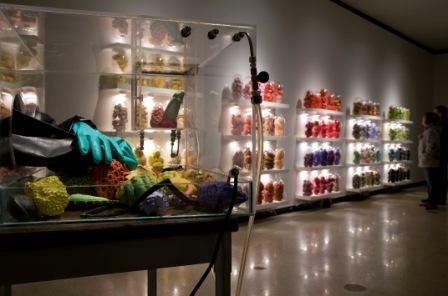 All works considering the genetic implications of the future. Another stunning work is Ken + Julia Yonetani “Still Life – The Food Bowl”, 2011, cast from the pinkish salt of the Murray River. This dystopic vision of ‘the food bowl’ of Australia made of salt. It is a traditional European still life with a table, glasses, fruit bowl, cutlery, fish and crayfish all solid salt. On a similar environmental theme Debbie Symons digital video work “Arrivals/Departures” 2011. Positioned beautifully over the gallery door “Arrivals/Departures” uses the familiar transport screen to record introduced and endangered species. Now that I consider it, these visions of the future are all very pessimistic, predicting an imminent environmental catastrophe. There is a great deal of pessimism in the visions. 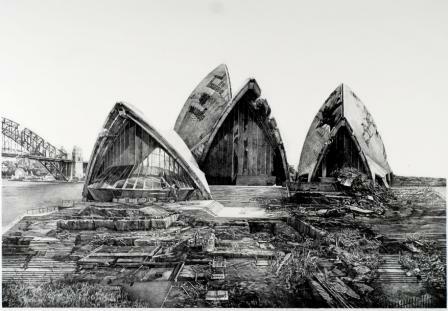 There are ruins in Hisaharu Motoda’s lithographs, Yves Marchand and Romain Meffre photographs of destruction and Kirsten Johannsen’s bean sprouts had wilted under the lights. But it didn’t feel that way when I saw it; it felt fun, intriguing and engaging.